Yo quiero tacos! Whenever we have no other ideas for dinner, we turn to this classic Mexican dish. Carne asada is thinly sliced and seasoned (or marinated) beef. While it literally means “roasted beef” it’s usually grilled, then served with toasted corn tortillas. A far cry from Americanized tacos (which are delicious too), these tacos are simple, delicious and healthy. Corn tortillas are super cheap but you can also make you own, which I’ll detail soon. Take it up a notch by topping these with some homemade guacamole and for full effect eat outside while drinking a beer, preferably of Mexican origin. 1. Preheat the grill or a skillet to high. Mix the seasoning ingredients in a small dish. 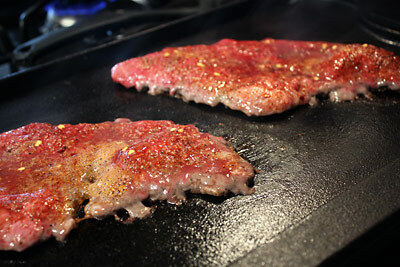 Sprinkle seasoning onto both sides of the steak and place on the hot grill or skillet. Sear for about 2 minutes per side until crispy, but be sure not to overcook. Remove the steak and slice into small strips. 2. Keep the grill or skillet on high and toast the corn tortillas on each side, until lightly browned. 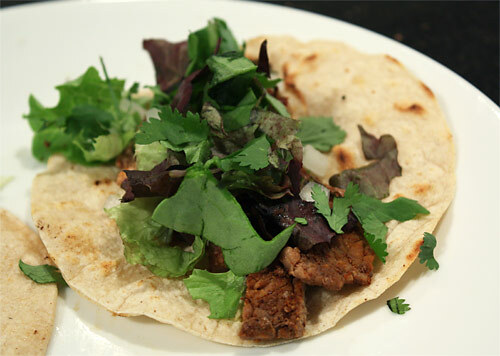 Place the steak in the tacos along with any toppings and serve with a side of beans, either Simply Boiled or Refried. Squeeze fresh lime juice over the top of each taco as well as into that Mexican beer! We love ’em too! This is a mainstay in West Texas. You can also top these off with some pico de gallo (lots of diced onions & tomatos, a little diced jalepeno, and a squeeze of lime juice. Then you use the remaining lime wedges to garnish that aforementioned Mexican beer such as Corona, Dos Equis, or Sol. Yes, pico de gallo is a perfect topping for these! I forgot about the limes – if nothing else, a quick squeeze over the tacos is delicious as well! Hi, Nick. I enjoyed your carne asada recipe and have figured out now that not everything with you is PB! Thanks for the post on one of my faves. I’ve given you a “Versatile Blogger” award, which you can get on my site when you have a moment. You know this is a staple of my family’s get togethers! Carne Asada is a great!